It’s been a drizzly, grey week here in Vancouver — perfect for daydreaming about our short but sweet January honeymoon in beautiful Maui, Hawaii. Christmas/New Years is definitely not the ideal time to visit Maui. For starters, there are hordes of people, prices skyrocket, and the weather can be unpredictable — we had everything from hot, sunny days to wild storms that cut off roads and cancelled boat trips. But with resort prices so high and the popular beach spots full of families, the holiday period is a good time seek out lesser-known places where you can live like a local. We were on a pretty tight budget but found a decent beachside apartment in North Kihei on the south-west side of the island, where the sunsets are amazing, the beaches are quieter, and you are still close enough to civilisation to wander down for a “shave ice” in the afternoon. 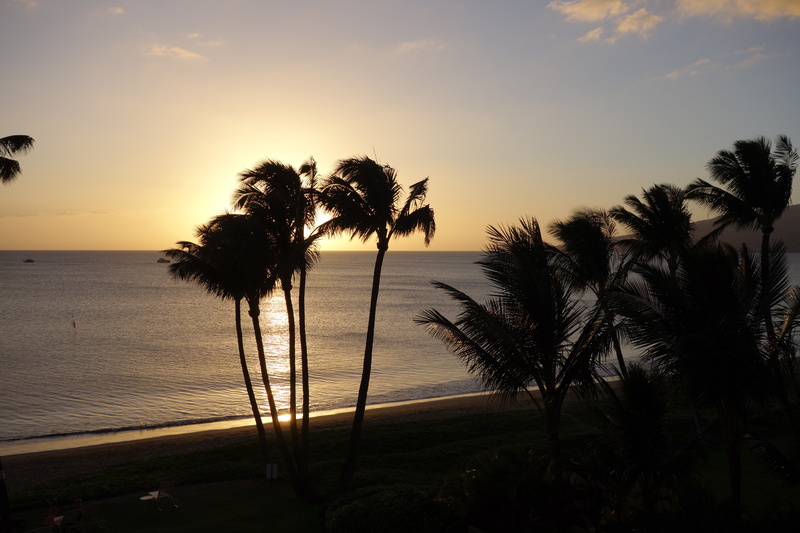 Best of all, you don’t necessarily feel like you’ve wandered into a tourist zoo, as can be the case in swanky Wailea or family-friendly (but windy!) Kaanapali. 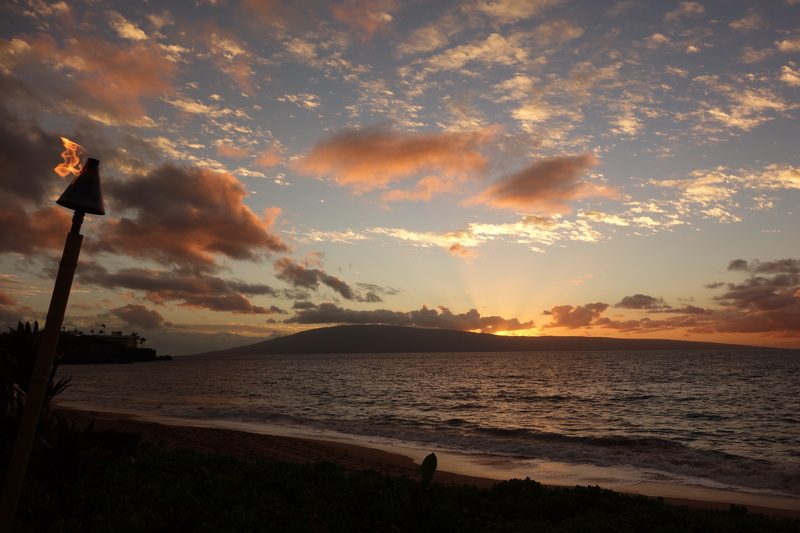 Maui is a diverse island, with long stretches of sandy beaches, surf spots, rolling valleys, rainforests and black stone beaches dotted across the island. 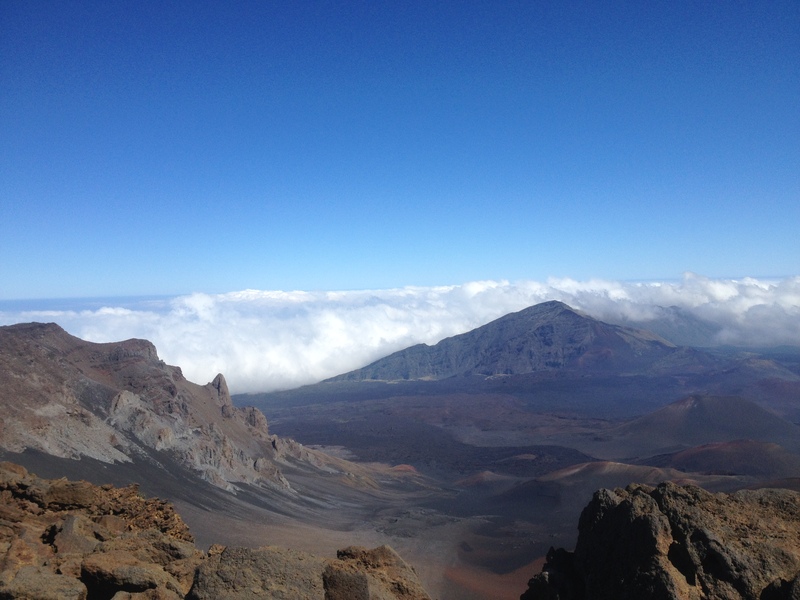 The centre is dominated by the towering (dormant) Haleakala volcano, while West Maui is also home to volcanic craters. Weather varies greatly across the terrain, which is good in “winter,” because even when the north and east is rainy, the south and west can be sunny. The rain rarely lasts all day anywhere on the island. Hands down one of the most stunning drives I’ve ever been on. Due to extreme jet-lag (coming from Australia post-Christmas and wedding) meant that we overslept and missed our rental car reservation, and instead received an enormous truck. 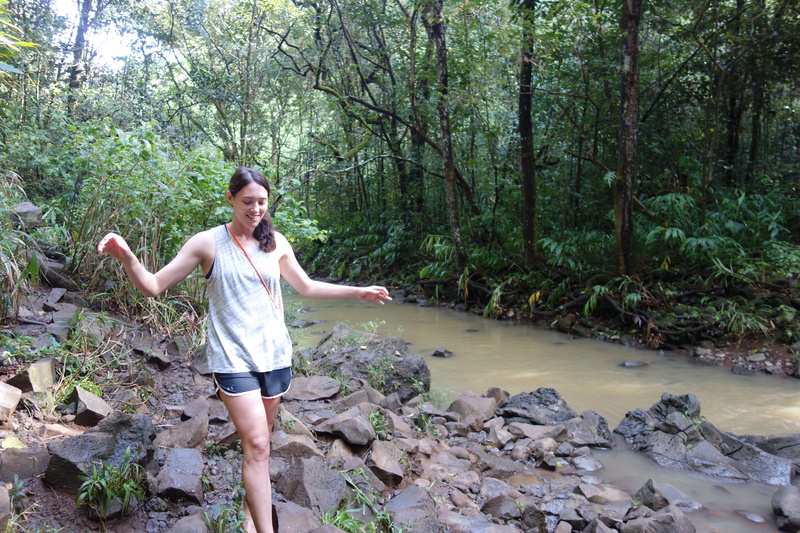 I definitely do NOT recommended this for the Hana Highway — which is a highway in name only. Really, it is a narrow, meandering, windy road that takes you past rainforests, overlooks, hidden beaches, tiny hamlets, and a shack selling the best banana bread I’ve ever tasted. My advice: Take all day to drive there and back (the through road across the backside of Haleakala National Park is not recommended by most hire car companies), pack hiking shoes, and try to hire a small car! 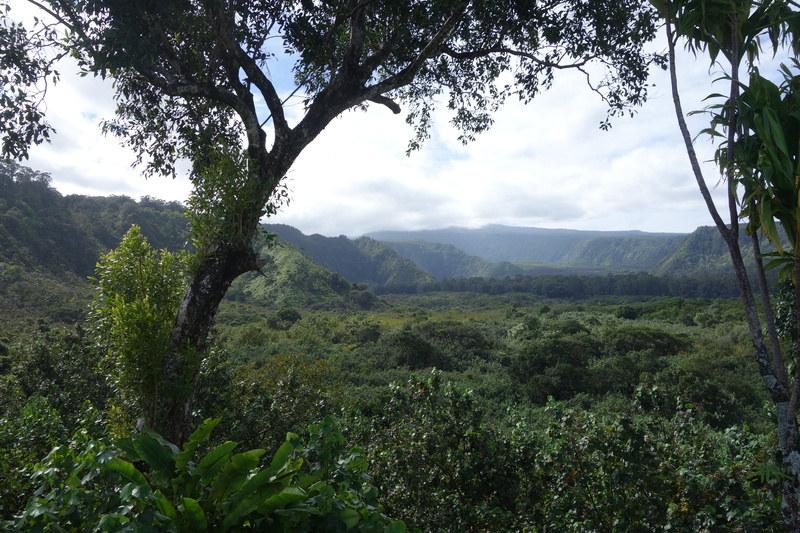 My favourite stop was Wai’anapanana State Park, where the lush green hills provide a strong contrast to the black sand beach and turquoise water. 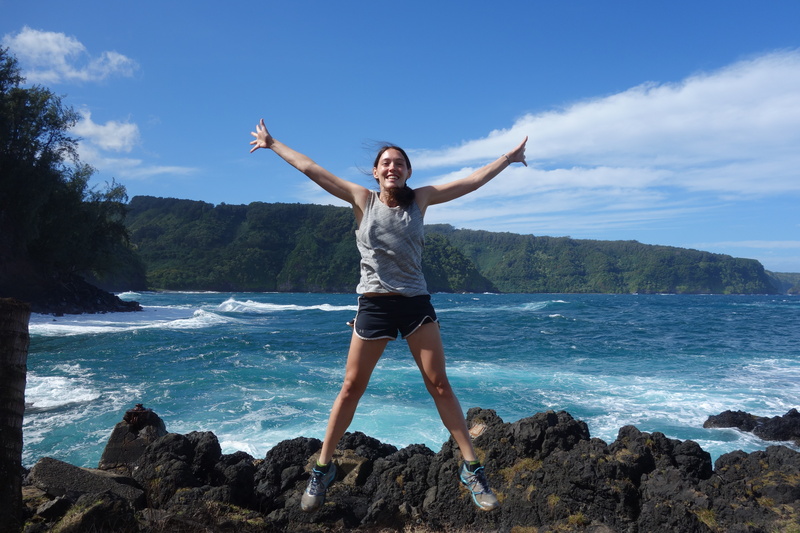 Other highlights included the muddy hike for a swim at Twin Falls, standing on lava flows while gazing at the ocean at Kenae Peninsula, and wandering over the rock pools at Ohe’o Gulch at Haleakala National Park (past the town of Hana). As cheesy as it sounds, this trip is about the journey, not the destination. 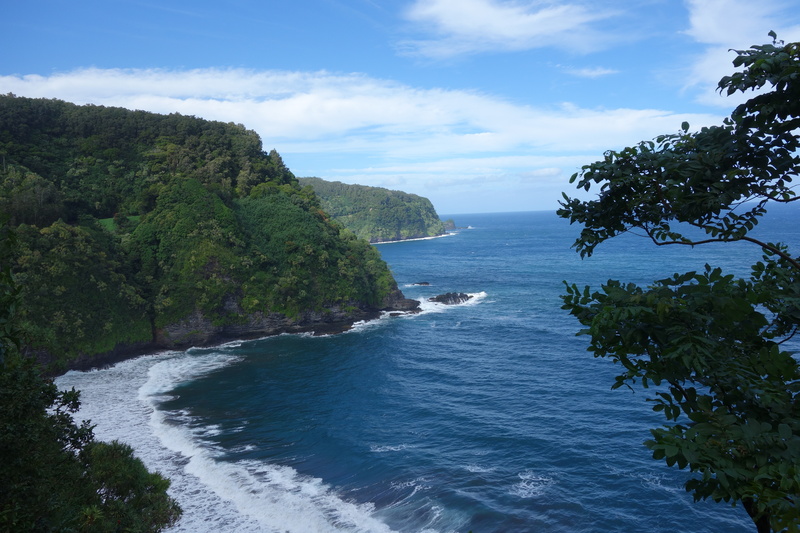 You’ll be disappointed if you rush through just to arrive at the tiny town of Hana, where there isn’t a whole lot to see. 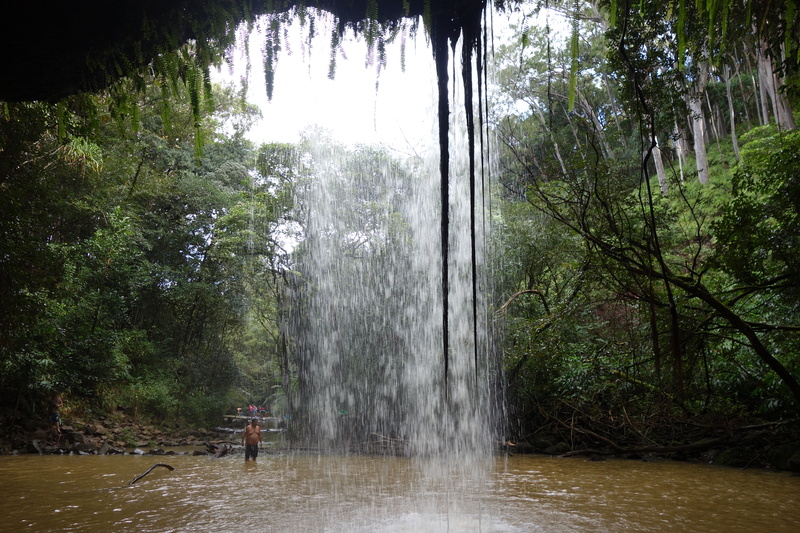 Instead, take all day to stop and explore the many waterfalls, hikes, and hidden treasures along the way. 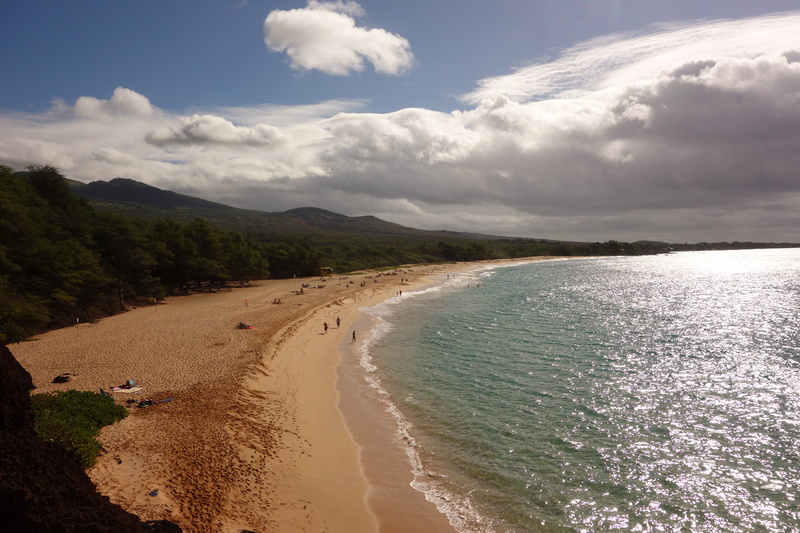 Long stretches of white sand, crashing waves, and a rocky outcrop with incredible views — it really felt like we were walking onto an Aussie beach when we first arrived at Makena Beach (more often known as “Big Beach). Unfortunately, after about an hour, it was packed. 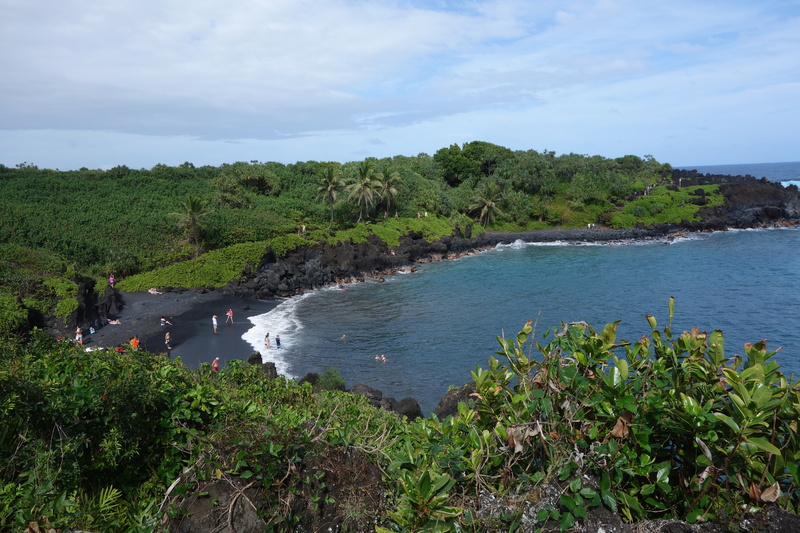 Climbing over the outcrop will bring you to “Little Beach,” which is a small “clothing optional” cove. Both beaches can have strong rips, so you need to be careful, but there is even some snorkelling spots if you paddle out to the rocks at Big Beach and beyond the breaks to the reef. Who would have thought it? Spam sushi and raw tuna are both actually delicious. Really! 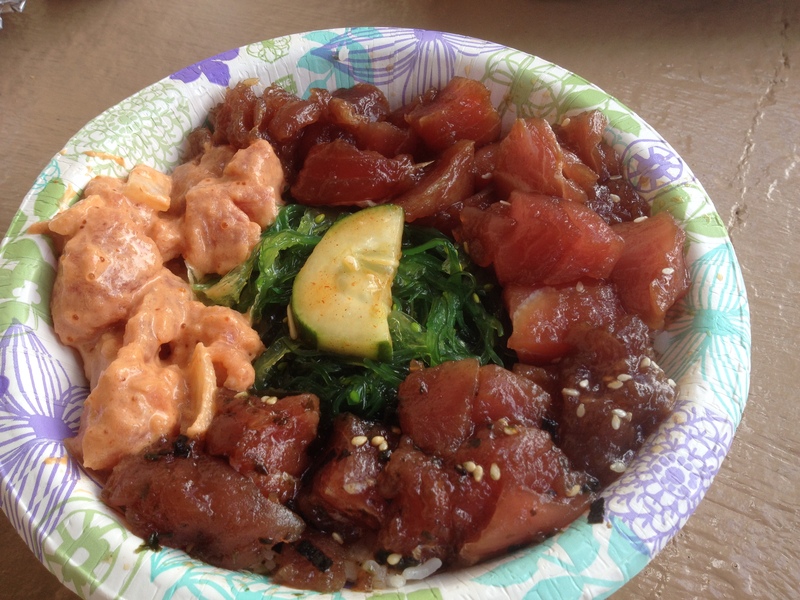 One of our favourite meals was the amazing poke served three ways from Eskimo Candy Seafood Market and Deli in Kihei. It’s not open on weekends and gets PACKED at lunchtime, so arrive early or late. We ordered musubi (spam sushi) from a few places (including a gas station) but the best was from Da Kitchen, also in Kihei. Finally, I was a pretty big fan of the cool treat “shave ice” (which you should apparently never call “shaved” ice, unless you want to sound silly). You can buy it at almost any ice cream vendor but the best was from Ululani’s (various locations), with Local Boys in Lahaina a close second. 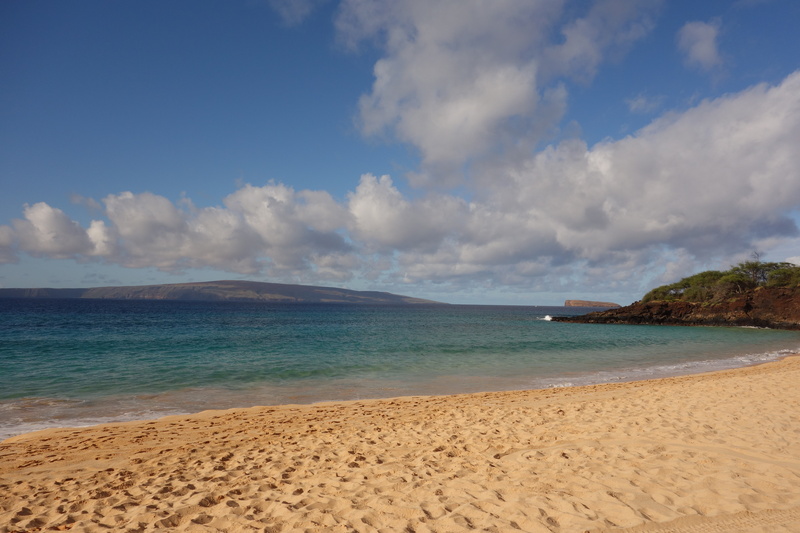 While Kihei is often touted as a great SUP spot, the waves were not cooperating on the day we decided to go. Instead, we headed up to the touristy but cute seaside village of Lahaina, where there are plenty of beaches (and places to rent boards). About 10-15 minutes south of town there are plenty of spots to try paddleboarding, where the sea was pretty flat but there were a few waves to catch. We parked near Papalaua State Wayside Park and hauled our boards out to a quiet spot. Soon enough we saw turtles, coral, and even attempted to catch some waves. 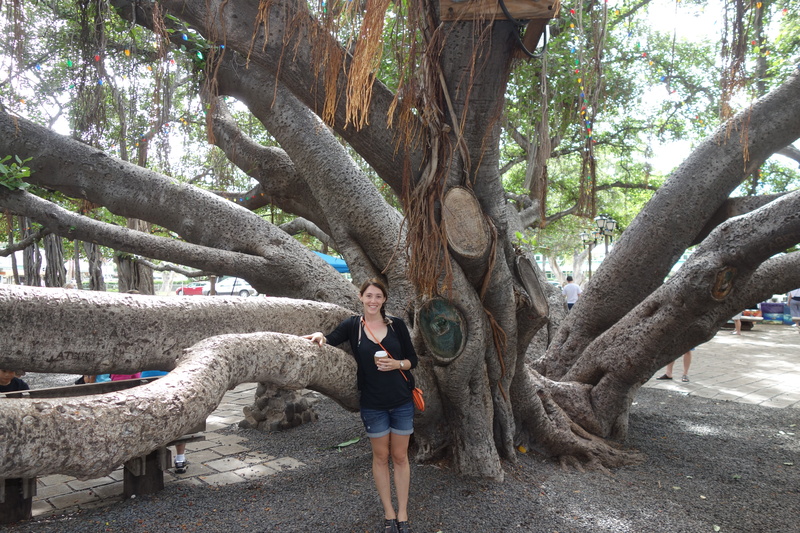 Lahaina itself is worth a visit if only to see the amazing Bayan tree, which spreads out over 200 feet (the size of a city block) and now has 12 trunks. This little hippy surf town is really the start of the Road to Hana, but it is cute enough to deserve its own entry. 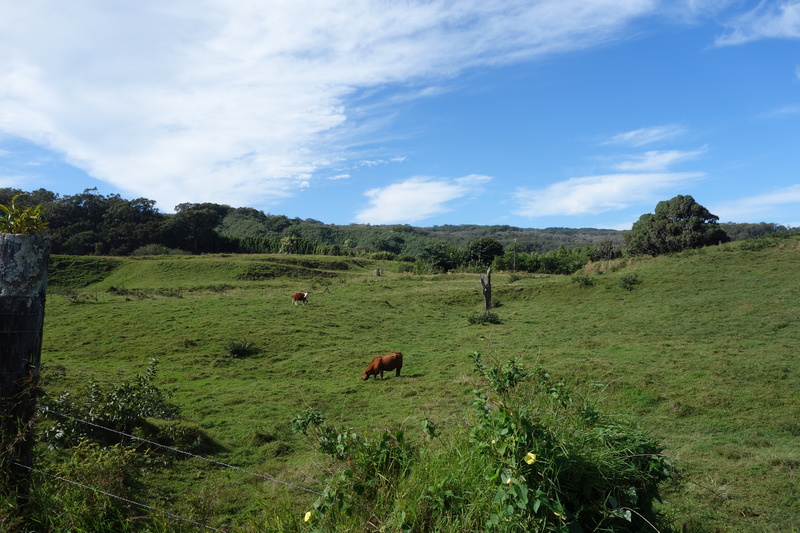 There are a few good cafes, a popular ice cream parlour, and plenty of places to pick up picnic supplies for the Hana Highway drive. Perhaps more of a drawcard is nearby Honolua Bay and the famous “Jaws” surf break that is only recommended for pros. During big swells, surfers are towed out by jet-skis, but sadly, the weather wasn’t on our side when we visited — no death-defying stunts to be seen. The main drawcard is the amazing crater and other-worldly views from the volcano — but you have to time your visit right. Get in early to avoid the mist that rolls in around lunchtime. We were not that smart and spent half the drive up the mountain in a fog, convinced we wouldn’t see anything at the top. Thankfully, weather changes quickly on a mountain. We were soon above the clouds with amazing sunny views. Our plans to hike the trails in the alpine were quickly dashed when we experienced the biting cold winds and realised we were really not dressed appropriately for the cool weather. Still, with a bit more planning, you can arrive super early to watch the sunrise, or organise a tour to take you up the mountain and bike down. I secretly thought a luau would be cheesy and terrible, but it was actually a fun way to experience local food and Polynesian culture. A lot of websites recommended the fairly expensive Old Lahaina Luau, but I was pretty pleased with the cheaper (but still fun) at the Royal Lahaina Luau. This wasn’t actually something we intended. There are no direct flights to Maui from Brisbane, so in order to save money, we flew in from Honolulu to the smaller Kahului Airport. Little did we realise our inter-island plane would be an eight-seater. It did give us some spectacular views though! 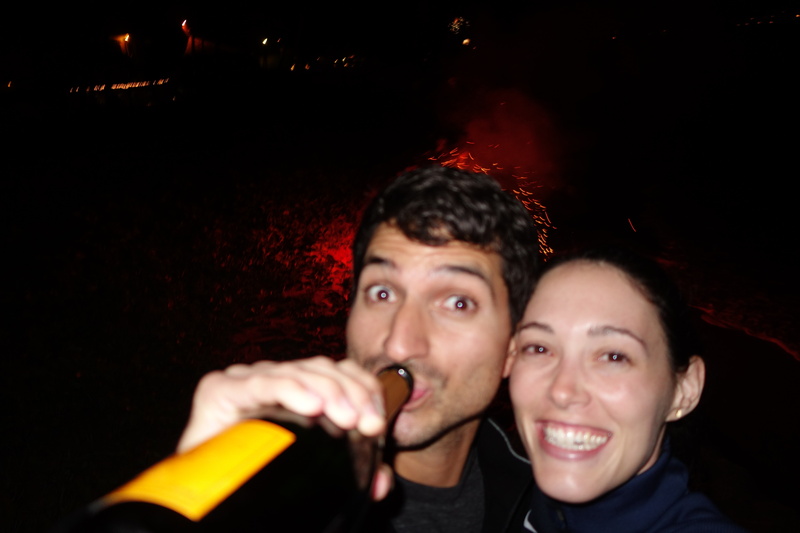 Coming from Australia where this is totally illegal, one of our highlights was being able to buy fireworks for New Year’s Eve! We loaded up, headed to the beach, and went to town. So really, it’s not all bad to visit a tourist hot-spot at a busy time of year. When all else fails, we just relaxed on the beach — and now that I’m writing this from rainy Vancouver, that doesn’t sound so bad at all. Take me back to the sun!